The Radford 415 is a modern, centre cockpit cruising yacht design. The plumb bow and sugar scoop stern give the boat an exceptionally long water line length for its size, resulting in excellent speed which complements the strength of the vessel’s steel construction. The 4 tons of lead ballast (poured in molten) sits very low down in the foot of the keel, due to its flared shape. This contributes to the design’s Range of Positive Stability (RPS) rating of Category 0, “Unrestricted Offshore Use”. The minimum RPS for this category for a yacht of 12.65m is 130.5 degrees. The Radford 415’s RPS is 144.4 degrees. The design has a modest beam (3.5m), a fine entry at the bow, and a deep V-shape in the hull. The result is strong sailing performance, especially to windward, and a beautifully comfortable motion at sea. Windward performance is a design attribute more often overlooked than not these days. The trend in many modern designs is towards very wide beams and flat bottoms, a recipe for heavy pounding when sailing to windward. This trend is a design tradeoff to maximize internal volume, often driven by the requirements of the charter market. In reality, cruising sailors have to sail to windward, particularly if, like most people, you are not on a circumnavigation involving a one-way trip. In other words, after you’ve cruised to the Whitsundays with a following SE trade wind, the day will come when you have to sail back. Windward performance is not just a comfort issue, it is also a critical safety issue. When caught on a lee shore in strong winds with an engine that won’t start, you’ll find out why. 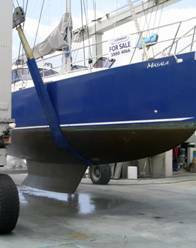 As well as slamming to windward, a flat bottom results in a shallow bilge with little or no room for under-floor storage of water and diesel. Thus in many boats the largest and best storage areas, such as under the saloon seats and/or under berths, are filled not with food and equipment but with water and diesel tanks. It is very hard to find sufficient storage space in such boats (the Adams 40 is an example). The Radford 415’s deep-V hull has plenty of room in the bilge for tanks. The deepest part of the bilge is about 75cm below the floor in Masala. From aft of the forward cabin to aft of the companionway she accommodates 640 litres of water, 300 litres of diesel, and a holding tank, all below the floor. Another benefit of having a lot of boat under the water is greater comfort in a rolly anchorage. It is a fact of life that all monohulls roll at anchor in the wrong conditions, but modern, rounded, flat bottomed fiberglass yachts are particularly prone to this because they sit “on” the water rather than “in” it. 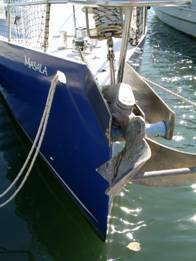 Keel shape and depth have a big influence on sailing performance and handling. 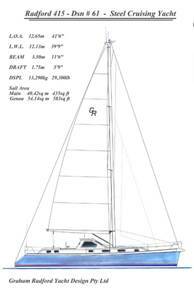 The Radford 415 keel is probably best described as a “long” fin (not a “deep” fin). This is a great compromise between the old-fashioned full length keel and the modern trend to deep fins (see next page for advantages and disadvantages of different keel shapes).